As a Girl Scout, you’ve probably taken part in a ceremony. You might remember lighting candles or holding the flag, crossing a bridge or welcoming a new girl into your troop. Ceremonies are an integral part of the Girl Scout year, covering topics including rededication, birthdays and awards, and even bridging to the next level of Girl Scouts. Bridging is an important transition in a Girl Scout’s life; it honors and celebrates a girl's “graduation” from one level of Girl Scouting to the next. This transition marks important milestones in each girl’s journey through Girl Scouting and should be celebrated by the troop, family, and close friends. Celebrating this change should be fun, personalized, and memorable for everyone involved. And most of all, it should be designed by the girls, with help from their troop volunteers. When does a bridging ceremony happen? Girl Scouts automatically recognizes a girl’s level in Girl Scouting based on her year in school. As soon as one school year ends and another begins, she is considered having moved to the next grade level—but when you choose to host your official troop ceremony is really up to the troop. You might decide to follow the school year calendar and host your bridging ceremony in late May or early June. You might decide to bridge during the summer, when the girls have had some time to finish up the last of the badges or journeys they started. Or, your troop might decide to wait until right when the new Girl Scout year starts (October 1st). As girls get closer to moving up to another level, tell them what steps are needed to complete bridging, discuss which activities the troop wants to participate in, and then work together to create a plan. Remember, a bridging ceremony is a culmination of all that your Girl Scouts have done at a level, and should represent each unique quality of your troop. Make sure girls take a leading role in planning, leading up to and running the ceremony. Just like in other Girl Scout activities, there is a natural progression in the level of participation. As girls get older, their participation should increase! Typically, a Girl Scout Ceremony has three parts; an opening, a main section, and a closing. During the opening, guests are welcomed and the tone is set with an activity such as a flag ceremony or reciting the Girl Scout Promise and Law. During the main section, the ceremony is explained to the guests and run by the girls and co-leaders. During the closing, guests are thanked and the celebration ends with an activity such as a friendship circle or flag ceremony. What is presented to the girls once they bridge? Below are the insignia traditionally presented to girls as they bridge. Girls may also need a new vest or sash, membership stars, and new guide books. The GSNC shop sells Bridging Kits that contain the awards and insignia each girl should receive as she crosses over to the next level in Girl Scouts. The kits are packed in a clear bag and include a certificate that can be personalized! 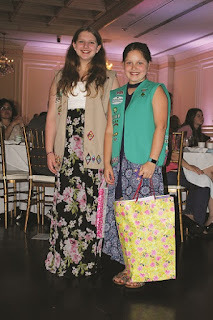 If you were a Girl Scout growing up, you probably have some memories of your bridging ceremonies. Maybe it was walking under an arch of balloons in the gymnasium of your elementary school or walking across the bridge at your local duck pond (the duck pond memory was when I “flew” up to Girl Scout Juniors… now as an adult, I see the symbolism). Did you know that there are actually requirements to earn those bridging awards? The Bridging Award is earned by completing a set of activities. Earning the award offers a chance to look back on what they’ve accomplished while looking to the future. Each level of Girl Scouting has its own unique bridging award patch. Although not required, completing the steps to earn Girl Scout Bridging Awards helps girls get a taste of what their experience will be like at the next level. Look Ahead! Meet with Girl Scouts at the level they will be bridging to and learn about the exciting adventures that lie ahead. Although these are the steps for girls to earn their bridging award, there are specifics on how girls at each Girl Scout level should fulfill the Pass It On and Look Ahead steps. Do you know a Girl Scout volunteer who turns frowns into smiles? Who inspires your girl to dream bigger? Or who offers endless encouragement? Whatever your favorite Girl Scout volunteer’s super power might be, let them know how much you appreciate everything they do! April is Volunteer Appreciation Month and April 22 is Girl Scout Leader Appreciation Day! Let’s say “thank you” to those who help make our Girl Scout experience possible! Write and send a thank you card or letter. Make it extra special by making the card yourself. Nominate them for the GSNC Volunteer of Excellence Award. Make and send your Leader a video telling her how much you appreciate her being a part of your Girl Scout story. Post a “thank you” on Facebook, Twitter, Instagram or in your Service Unit group on the OLC. Take a picture of the entire troop and make a frame that includes the signatures and/or notes from each girl. Bake a cake or cookies. This year, Girl Scout Week is extra special for Girl Scouts of Nassau County because we are celebrating 100 years of Girl Scouting in Nassau County!! Commemorate this special week by taking the challenge! Complete at least one activity from each day of the Girl Scout Week calendar. View GSNC's Girl Scout Week Calendar and Game. The 107th Birthday of Girl Scouting (March 12th) begins with Girl Scout Sunday on Sunday, March 10th and ends with Girl Scout Sabbath/Shabbat on Saturday, March 16th. What better time to review the ways we can link Girl Scouts with their Faiths. Learn how Girl Scouts can connect with their Faiths. Visit one of the Girl Scout history collections being displayed throughout local communities during the month of March. This year, Girl Scouts of Nassau County is celebrating 100 years of Girl Scouting in Nassau County. To commemorate its centennial anniversary, the council will be hosting a historical exhibit 100 Years: Empowering Girls Through the Decades. The exhibition, which will highlight a collection of vintage Girl Scout uniforms, patches, artifacts, photos, and more, will be available at four locations throughout the county in partnership with the Town of Oyster Bay, Town of Hempstead, Town of North Hempstead, and Nassau County. #gsnc100 Learn more about visiting a Girl Scout history display. The Centennial Patch program will enable Girl Scouts to explore how the Past, the Future, their Self and their Community have positively impacted their Girl Scout experiences in Nassau County. Get started on GSNC's Centennial Patch Program! Centennial Patch Program "Tell Your Story" form. Centennial Patch Program "Service Hours" form. With all the cold weather we’ve had these last few weeks (yes, spring we are ready for you), our Girl Scout Leaders are thinking outside the box, planning indoor activities for their troop meetings... activities that keep Girl Scouts active, while also challenging them to try something new and different. Besides selling Girl Scout Cookies outside during winter months, most troop meetings are likely to be spent inside where it is warm. Try some of these badges with your troop, while staying toasty... And if your troop is really are itching to spend some time in the outdoors, try winter/spring troop camping at Camp Blue Bay or your local Girl Scout Camp. Don’t be intimidated by these badge titles! Everything is planned for troop leaders on the VTK, and the materials are not hard to come by. Good Neighbor Badge- Learn about being a good neighbor and citizen at school, and explore the communities in your town and state. Roller Coaster Design Challenge Badge- Learn about engineering and motion by building a roller coaster car and ramp. How Robots Move: Learn about the parts of a robot and computer programming, and create step-by-step programs. Celebrating Community Badge- Learn what a community is and explore the landmarks and symbols that makes it special. Girl Scout Way Badge- Learn all the things that make Girl Scouting special. Household Elf Badge- Have fun solving problems and being good to the Earth. Balloon Car Design Challenge Badge- Explore potential and kinetic energy, jet propulsion, and how it applies to designing a balloon-powered car. Detective Badge- Learn code, fingerprinting and observation skills. Entertainment Technology- Learn the art of animation, dream up video games, create special effects, and learn how to design a thrilling roller coaster ride. Public Speaker Badge- Find your inner performer and learn how to be unafraid to speak up. Screenwriter Badge- Create a screenplay for a show or movie. Eating for Beauty- Learn how to eat your way toward a healthy mood, mind, and body. Financing My Future- Learn how to plan for your educational future, including ideas on how to pay for it. My Portfolio- Learn to show college admissions officers and employers what you’ve learned from your cookie sales experience. Troupe Performer- Learn how to organize a team of people and put together a performance. On My Own- Understand the importance of creating a budget- a skill that will help you wherever life leads. Dinner Party- Learn how to make and serve a fabulous three-course meal. Good Credit- Learn about ways to borrow money and understand the importance of establishing good credit. Celebrate our Centennial by traveling through time and taking part in World Thinking Day! World Thinking Day dates back to 1926, when delegates from all over the world met at Camp Edith Macy in Briarcliff Manor, New York. At this meeting, it was decided that February 22 would be known as a special international day of friendship for Girl Guides and Girl Scouts from all walks of life. Every year since, World Thinking Day has called for Girl Scouts and Girl Guides to join together to take discuss issues that affect young women and take part in activities that promote changing the world for the better. This year’s World Thinking Day theme is Leadership. Are you looking for ways to celebrate World Thinking Day? Try one or some ways of these activities to join the celebration. Define the word “leader.” What does it mean to be a leader? What are some characteristics of a leader? What are some examples of leadership in a Girl Scout troop, school, or on a sports team. How does leadership apply to changing the world? Earn the 2019 World Thinking Day Award by completing the World Thinking Day theme activities. The World Trefoil Pin is earned by girls once, and is moved from vest to vest (sash to sash), throughout their time in Girl Scouting. Looking to earn the World Trefoil Pin with your troop? View the ceremony and requirements. Work on GSNC’s Juliette Low World Friendship Council Patch Program which is a "Countdown to Thinking Day." Earn the 2019 Global Action Award. Play games from around the world. Is Your Troop Girl Scout Cookie Booth Sale Ready? Girl Scout Cookie Booth Sales are now through March 31. Whether you are brand new to the Girl Scout Cookie program and booth sales, or a seasoned veteran, here are some important tips to be booth sale ready. Smile, and be friendly and polite. Girls should greet potential customers in a welcoming way, and should pay attention to the booth sale, customers and surroundings. No yelling or loudly calling out to customers. Girls should wear attire that shows they’re a Girl Scout. A Girl Scout Vest, Sash or Daisy Smock are all great options. Not only can they be worn over a jacket, they showcase all adventures your Girl Scout troop has gone on, and all that your troop has learned. Keep the table neat and clean, with signage and the cookie varieties on display. An organized cookie box display allows customers to see what is available. A good booth will also display signage that clearly identifies the booth as a Girl Scout Cookie Booth and include price, your troop number and cookie goals. No food or drink on the selling table. Have at least two, but no more than six girls present, and have there appropriate adult supervision. Remember to check Safety Activity Check points for the appropriate coverage amount. No Tag-Alongs at the table. Make an Operation Cookie or troop Gift of Caring Jar to have on display for your customers to see. Girl Scouts at a Cookie booth sale should know about the Girl Scout Cookie Program and Girl Scout Cookie variety, including information about Operation Cookie and your troop’s Gift of Caring donation programs. Girls should also be able to explain what their troop plans to do with their troop proceeds. Remember: Girls should always say “thank you” to potential customers. Check out the Good Booth, Bad Booth flyer on GSNC’s OLC to see our guidelines. Use the coloring sheet to teach your girls proper cookie etiquette! The Cookie Program can be a very Rewarding Experience! 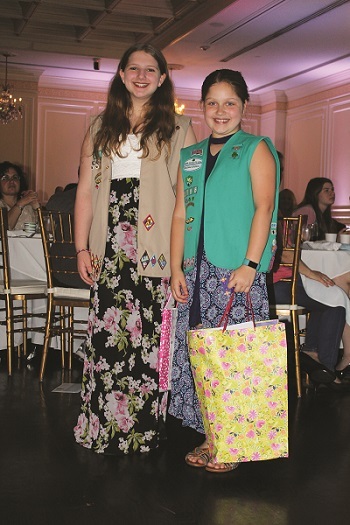 Girl Scouts Isabella I. and Maya T. both earned a trip to Niagara Falls last year by each selling over 4,000 boxes of cookies. These go-getters are real goal getters, too! They each set their sights on a goal and achieved it. What did Isabella take away from this awesome trip? "I really enjoyed going on the Niagara Falls trip this year. I was very excited to have another top seller, Maya, on the trip with me to experience the many attractions in Niagara. There were so many fun things to do; my favorite was the ghost tour because there were always interesting facts and cool stories which created a great experience."